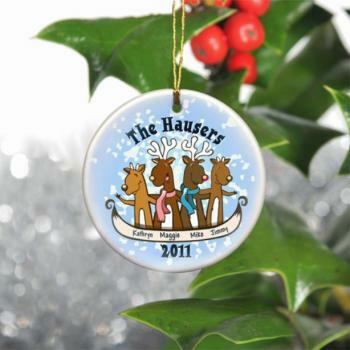 Get your herd in the holiday spirit with our reindeer family ornament. Select a family of four, five or six and personalize it with all of your reindeer's first names (up to 10 characters per name) and the Year. Measures 3" in diameter and comes with a metallic gold ribbon for hanging. Personalize with first names, family’s last name and year.